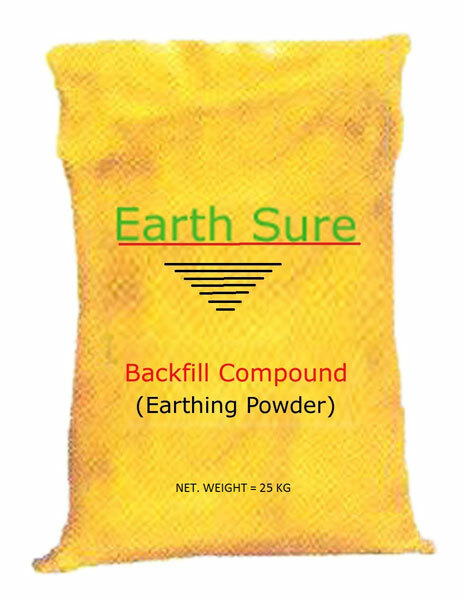 We offer the best quality Earthing Backfill Compound which is a special mixture of natural minerals that is used in chemical earthing so as to increase the effectiveness of the earthing. The quality which makes the backfill compound stand out and deliver is its hygroscopic nature. Due to the hygroscopic nature, it has a high moisture retention capacity which is must in earthing systems. Even in adverse hot weather conditions the Earthing Backfill Compound maintains the necessary moisture level required around the earthing electrode. Easily forms a homogeneous mixture with water. Requires very less time for settling down and getting in tune with any kind of soil. No need of mixing salt or charcoal with it. Prevents the electrode from corroding as it forms a protective covering around the earthing electrode. Packing : 25 kg/15 kg.